Our range of products include jetbound machine. Vallava Offers a comprehensive line of High-Performance post printing machinery. Casing In Jetbound Machine form the core of the our Hard case series solutions that deliver optimum results. The machines offered are designed and fabricated under the supervision of our professionals in adherence with the international quality standards. In order to meet the customer requirements, we have re-developed to bind any type of hard cover books and albums and incorporated many innovative inputs with variegated specifications within one machine. It is owing to the features like operator friendly, no wastage, no maintenance cost hassle-free performance, these are widely will appreciate by the customers. 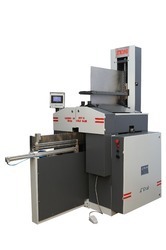 Vallava Offers a comprehensive line of high-performance post printing machinery. Our case maker, casing in be joint fomiing machine form die core of the our hard case series solutions tare deliver optimum results. The machines offered are designed and fabricated under die supervision of our professionals in adherence with the international quality standards. In order to meet the customer requirements, we have re-developed to bind any type of hard cover books and albums and incorporated many innovative inputs with variable specifications within one machine. his owing to the timbres like operator friendly, no wastage, no maintenance cow, hassle-nonperformance, these are appreciated all our customers. The book automatic feeding system is made by incorporated PLC based operation system, timing can be programmed as per the operator working speed. The book will be fed automatically in the automatic book holding system to smoothly hold die hook in the right gauge. This helps to glue the book both the side properly front reeving me spine area up to the end. The cover feeding system is manual. This helps in keep mg the book in the right gauge. The book spine, hard cover and the book spine thickness should always match the center spine board of hard case cover. Vallava Jetbound model casing-in with modular design and a range of accessories ensure maximum flexibility and productivity. Casing-in comes in two variations i) Special model for Album Making (ii) General model for all other types of hard bound book binding. The PLC bawd program mac-him is incorporated to con& the speed of center plate and glue roller. In addition, it is an extra feature for right rotary calendering mil. This unit will add tremendous value and final finish to your prod. The hook spine thickness and center hoard size should always. The rollers wig adjustable thickness press and effective W ti MM this calendaring process. The centre plate inserts the book to the calendaring rollers properly.